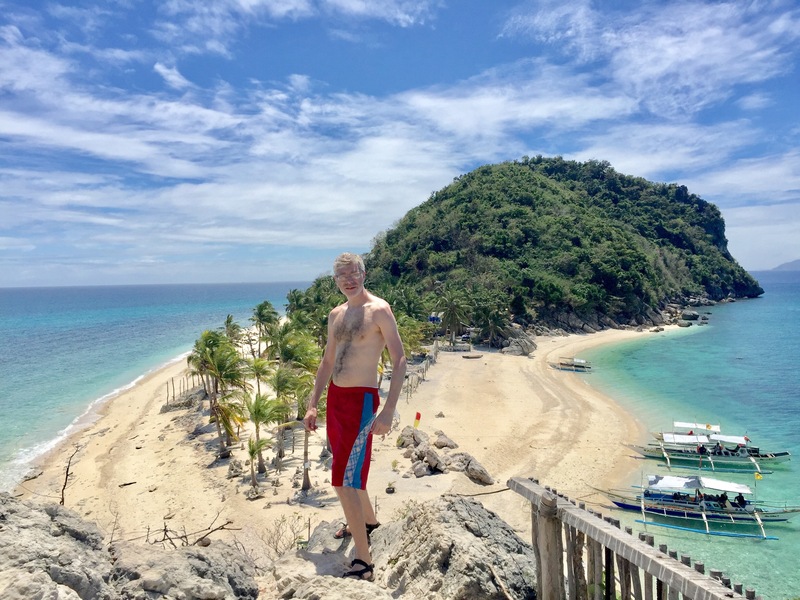 Isla Gigantes is a chain of beautiful islands in Carles, located in the northernmost part of Iloilo (Western Visayas). It has two main islands; Gigantes Norte and Gigantes Sur, around which a small group of minor islets is clustered. Gigantes! The name dates from the Spanish colonial era and comes from legends describing enormous human bones found inside Bakwitan cave. However, with the fading sun, as I gazed across the water at the islands, they looked to me like ancient sleeping giants. So, I have my own explanation for the name Gigantes. I visited Isla Gigantes last year on a tour package for four for 3Dys & 2Nts at 2485/pax. It was a good deal with meals, accommodation and boat rides all inclusive. 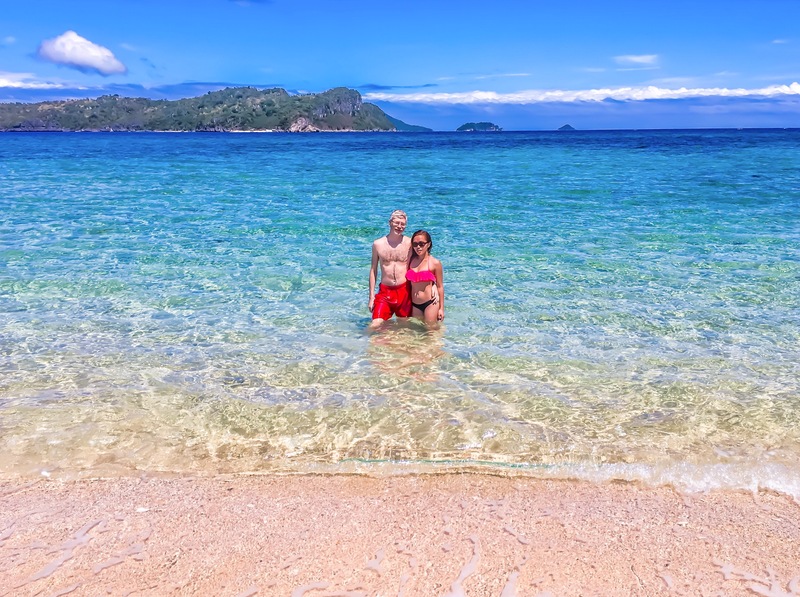 February of this year I decided to go back to Isla Gigantes, this time with my husband. We were looking forward to a bright and sunny holiday after coming from chilly England. We decided to stay for six days, yes six wicked days in paradise! You can fly to Iloilo city from most airports in the Philippines but be aware of arrival times. Most flights arrive too late to catch the ferry which departs ONCE daily from the port of Estancia to Isla Gigantes at 1pm. The trip back to Estancia is also ONCE daily which leaves at 8am in the morning. As we arrived at Iloilo airport late afternoon, we had already anticipated missing the ferry so we taxied to Northview Inn in Jaro to stay overnight. The next morning, we took a short jeepney ride to Tagbak bus terminal to catch the van to Estancia Port. You can catch one about every 30 minutes and expect to pay PhP 150.00 for each passenger. The bus takes around three hours to reach Estancia. Nick greeted us at the port and guided us to the passenger boat. Nick by the way, is one of Joel Decano’s (resort owner) men, and I knew him from my previous visit. The boat fee from Estencia to Gigantes is PhP 80.00 per person and sailing time about two hours to Gigantes Norte. This picturesque island saw all the travel stress, dissipate into the salty air. It’s a wonderful feeling finally arriving at the islands and the sense of magic starts as you land on the beach. The main resort is called Hideaway Inn and is a short walk from where we are in the photo. However, we had chosen to stay in one of its smaller satellite resorts on a small islet called Bulobadiang. So why did we choose the small island? Simply because it’s isolated, raw and our cottage was on the shore looking out over the sea. It’s the only resort on the island and if you want a serene holiday, Bulobadiang is the place to stay. Unlike the main island which holds a disco every Thursday and Saturday (if I’m not mistaken) and they also hold basketball games during the week, and I tell you, the sound system they use for this is aggressively loud. Okay, here is our lovely chalet in Bulobadiang. It’s normally for a group of four to five people but we had it just for the two of us. We paid PhP 200.00/night/person which is very good. Although, the toilet and shower were communal, so take note if sharing bothers you. 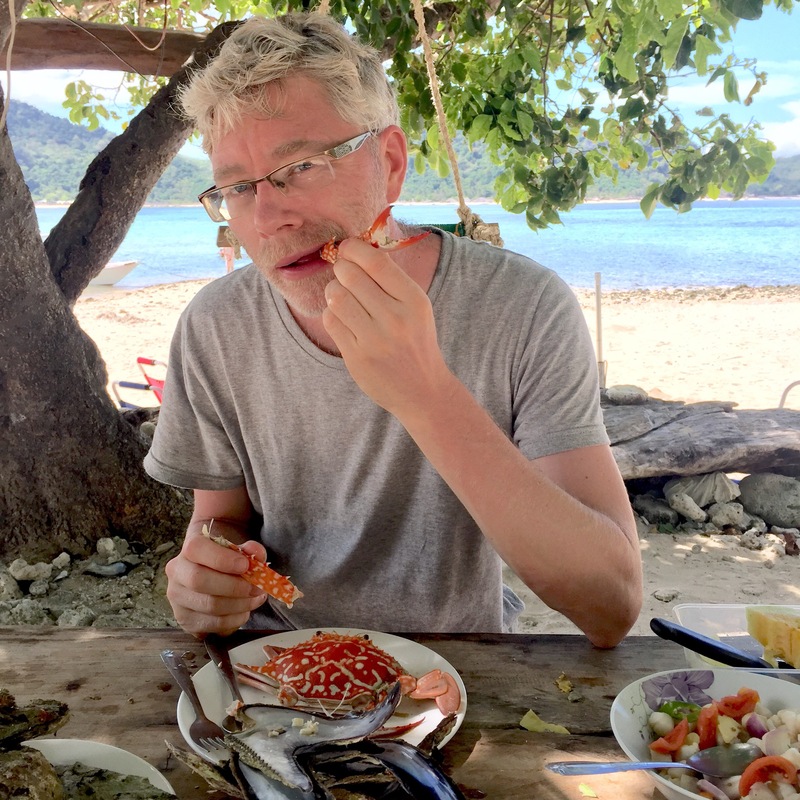 Food-wise the island mostly relies on serving seafood such as scallops, fish, crab, squid and wasay-wasay (oyster look-a-like thingy). We enjoyed a yummy seafood spread for the first two days but come the next day, we had had enough of it. Scallops can soon become samey. So, we began to make suggestions to the crew about what we fancied on our table and they were happy to oblige. We also requested some fruit and a plentiful supply of buko (young coconut) to drink. They were very helpful and attentive to our needs, very lovely people indeed. They even let me cook our own food in their kitchen once or twice. I really enjoyed it as cooking is also my passion. If like us, you are not going for an inclusive package deal, you still don’t have to worry food expenditure as meals are very reasonably-priced. Getting through the seafood spread. Beautiful sunset view from Bulobadiang. We hired a boat to cruise to Bantigui and Cabugao Gamay Island. Normally, they would charge PhP 2000.00/day, but I as able to haggle it down to PhP 1500.00. We chose not to get a guide as I had been there before but a guide isn’t always essential as there are plenty of people to talk to who will help and give suggestions about where to go and what to see. First stop was Bantigui Island. It has a gorgeous sandbar and the crystal turquoise water is amazing. Had a refreshing morning dip with the place almost all to ourselves. It’s best to start island hopping as early as possible before tourists pile up. It’s cooler in the morning too! We walked to the further end of the island and climbed up onto a small rocky outcrop to take photos. It was fun exploring around the coast and I realized that hiring the boat myself meant we weren’t restricted by time. Many packages only allow so long on each island hop and if you want more freedom it’s worth considering hiring the boat yourself directly. Next stop was Cabugao Gamay (small) island. One end of it has lush vegetation, whilst on the other end is a rock formation overlooking the sea which has become an iconic spot for tourists to take photos. In between, is the beautiful sandbar dotted with coconut trees. 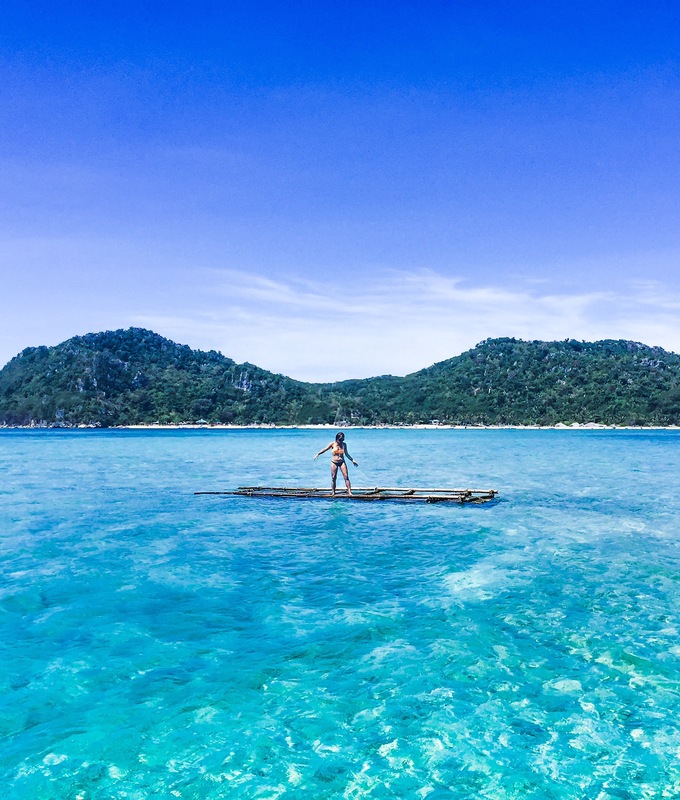 The island is surrounded with bright blue green waters which again, are perfect for swimming. There is also an eatery there, so no worries should you feel peckish. We sailed back to Bulobadiang and lazed in our chalet and spoiled ourselves by drinking a buko or two. By the way, we got badly burned that day, especially my husband. Luckily enough we got some fresh Aloe Vera from the locals and that helped sooth our skin. So important reminder, bring the highest SPF possible and apply liberally. The following day, we just chilled at our resort in the morning, drinking buko and eating fresh fruit. They don’t normally have fresh fruit there but they’ll procure some for you, as long as you let them know in advance. Later we took a trip back over to Gigantes Norte to see the ruins of the old Spanish lighthouse in the north of the island. It costs PhP 15.00/person on a motorbike and it takes roughly 10 minutes to get there. 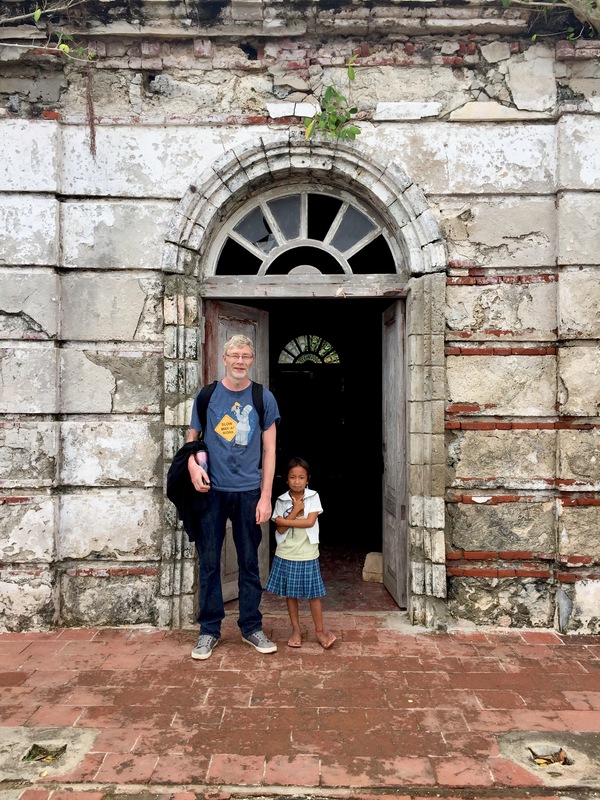 However, we chose to go by foot as it wasn’t too hot and we also wanted to see the little community on the island. There were a lot of school kids greeting us as we walked with their bright smiling faces. One even walked along with us to the lighthouse. There she is on the photo below. 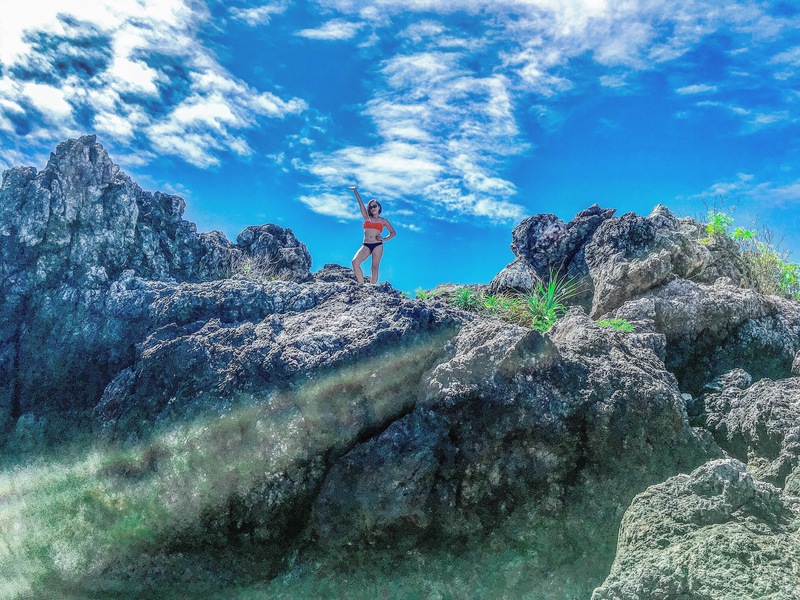 Antonia beach is another must-see spot in the Gigantes island group. It’s a mini haven for snorkelling and kayaking. Snorkelling costs PhP50/hr for the gear and kayaking PhP200/hr, although prices might change. They also sell fresh scallops here at PhP1 each. I had a great time snorkelling seeing the beautiful coral and colourful fish. I would suggest to bring your own snorkelling set, because the gear they rent out is a bit old and overused. After a few lazy hours in the water we sailed on to the Tangke Saltwater Lagoon. This beautiful hidden spot is surrounded by towering rock formations. We arrived early so the tide was still quite low, but we were not bothered as we’d already swam a lot at Antonia beach. Luckily it was empty except for the caretakers who collect the fee to see. You will agree with me when I say this place is beautiful gem. Great, innit? 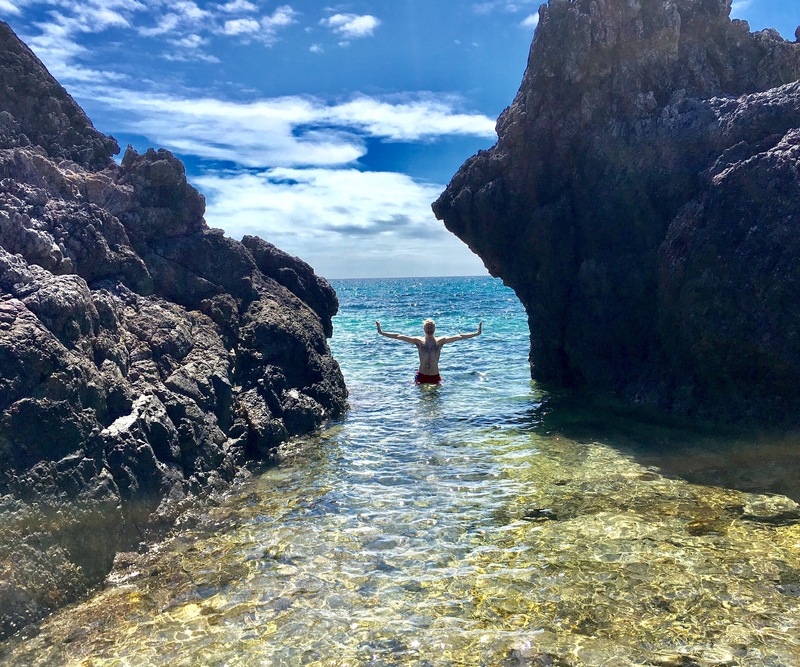 Tourists started to arrive but before hopping on the boat, my husband made a 30 foot cliff jump into the sea, just outside the lagoon. I did it last year- totally exhilarating! This time I was little bit of a pansy cake and didnt jump. Okay, next stop was Isla Uaydajon. We spotted it from the boat and when I pointed it out to our boatman, he happily took us there. This island is uninhabited, although our boatman said that there was a little resort not long ago but unfortunately stopped doing business after being hit by the recent tropical storm. Locals have said that this island is for sale, ‘if only we could afford it’, I thought to myself. Hahaha! This island was a little too rocky to swim so we just explored. We spotted a few beautiful empty shells scattered around that must have been decorative remains from the resort which had once been here. We didn’t stay long here as the scorching heat of the sun was draining us and we were hungry. Sailing back we passed two islets- the Gigantillo and Gigantuna islands. Gigantillo is a massive rock formation with lush green sprouting over it. We decided to stop in Gigantuna as I got curious about the ruin I could see from a distance. The boatman narrated that this ruin used to be a holiday house of an old mayor of Iloilo and was wrecked after a big typhoon hit. We briefly disembarked to look and take photos. 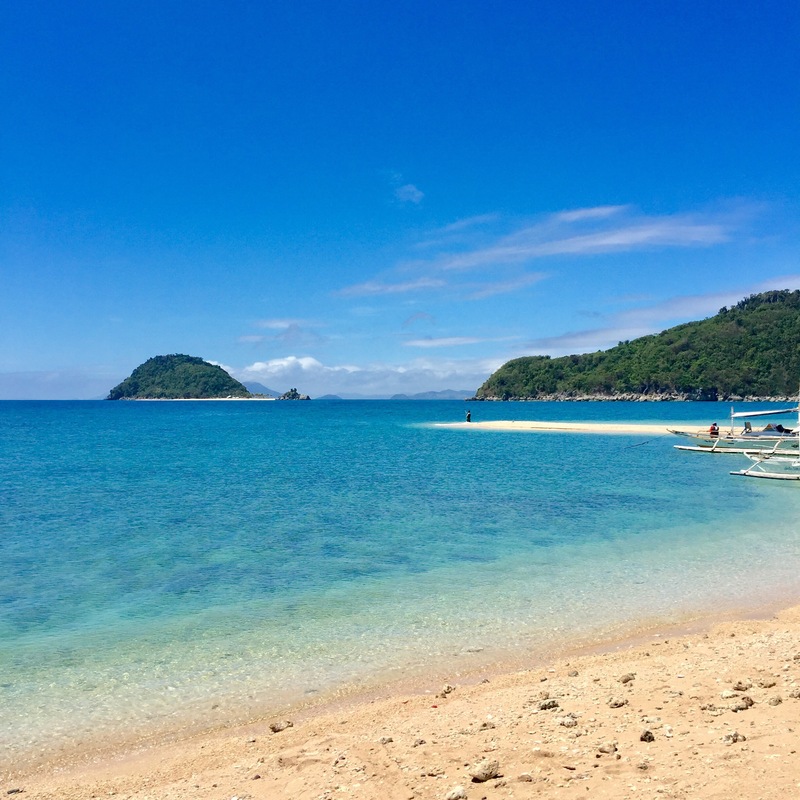 Depending on the time of month, the tide can go low enough in the late afternoon, to be able to walk across from Bulobadiang to Gigantes Norte. 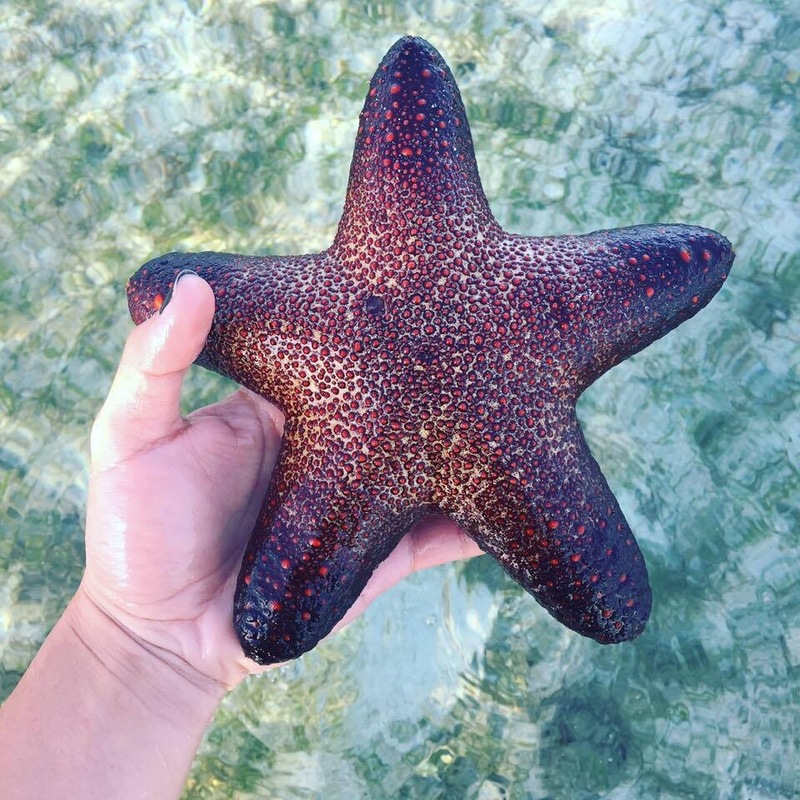 As we waded through the clear waters, we could see the beautiful coral, various coloured giant starfish, stingless jelly fish and some interesting fish. We also spotted a few sea urchins. Dont worry I put this beauty back in the water! Here along the shore of Gigantes Norte, the locals are de-shelling mountains of scallops ready for delivery the next day. The scallop shells are all over the sandbar, literally millions of them. The piles of shells serve as much needed barrier, shielding the island from the high waters during typhoons. A full and active day was dutifully rewarded in Hideaway Inn Resort with a gin and tonic for me and beer for my husband. It was dark when we were given, what turned out to be the best boat ride of the holiday, back to Bulobadiang. The heavens were so clear and spectacular with The MILKY WAY hanging above us in starry splendor! Even if I’d had a long exposure camera I’d never capture the awe of that amazing sky. Beautiful beyond words. Spent this day soaking in the island one last time. We read our books drinking buko and enjoyed the company of the people there. Had a great time swimming, relaxing and just enjoying the tropical haven and natural beauty of the place. At the back of our minds we dreaded having to leave but like all good things the holiday was drawing to its end!!! Day 6 Ciao for now Gigantes! Important reminder: Bulobadiang doesnt have electricity, although they have a generator which they turn on 5pm until 10pm. Great photos! Especially those that were taken by gopro 🙂 I hope that you enjoyed your stay. There are tons of things to do and explore in the Philippines. More power! Thanks and thanks for reading! yes we did enjoy our stay. I agree, the Philippines is not just packed of wonders, it’s overflowing with it. 😁 More power to you too!